Microsoft has just published its FY18 Q4 earnings. The results are very good for the Redmond-based firm, with double digit growth observed in all three of its operating groups. 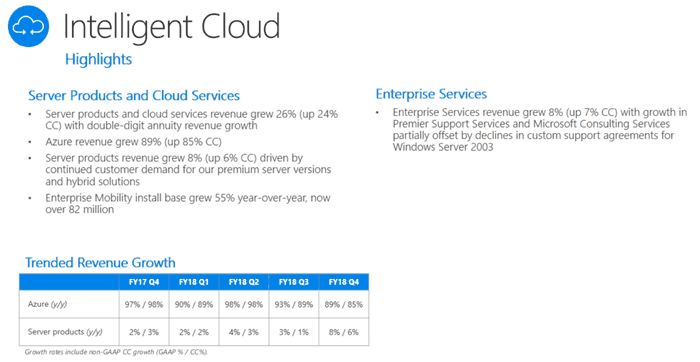 Within these groups highlights were the Azure cloud revenue growth of 89 per cent, Dynamics 365 revenue growth of 61 per cent, Gaming revenue up 39 per cent, Office 365 revenue growth of 38 per cent, Surface revenue up 25 per cent and Windows commercial products and cloud services revenue increased 23 per cent. Overall, Microsoft raked in over $100 billion in revenue for the year ($110.4 billion - up 14 per cent from last year), a company record. The most recent quarter's revenue was $30.1 billion. As Bloomberg reports, the figures topped estimates, and it sums up that sales and profits were mainly boosted by customer sign-ups for more internet-based storage, processing and Office productivity software. The results were better than analyst expectations and as a result the share price is up 3 or 4 per cent in afterhours US trading. In the results statement Microsoft's CEO, Satya Nadella, wrote "We had an incredible year, surpassing $100 billion in revenue as a result of our teams' relentless focus on customer success and the trust customers are placing in Microsoft". Nadella went on to boast of Microsoft's foresight "Our early investments in the intelligent cloud and intelligent edge are paying off, and we will continue to expand our reach in large and growing markets with differentiated innovation". 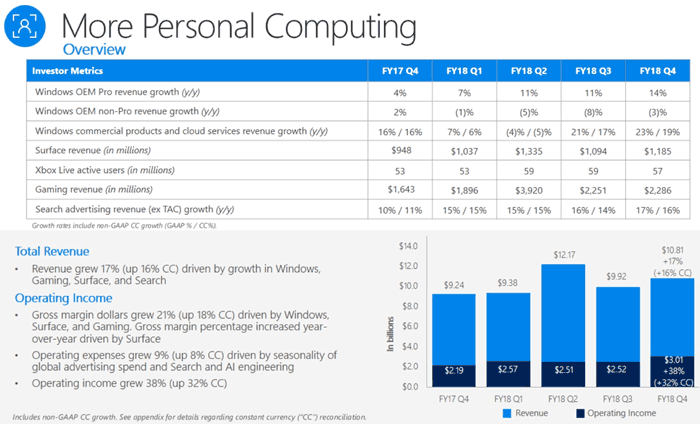 Microsoft's three operating groups are pretty evenly split in their contributions in the most recent quarter; Productivity and Business Processes collected revenues of $9.7 billion, Intelligent Cloud $9.6 billion, and More Personal Computing $10.8 billion. As noted above, the Intelligent Cloud component businesses were probably the best performers, but nothing looks week. HEXITEs might be most interested in the More Personal Computing segment. Here we saw Surface revenue up 25 per cent, Windows OEM revenue increase 7 per cent, and Gaming revenue increase 39 per cent (Xbox hardware, Xbox games and services), last but not least Search Advertising revenue was up 17 per cent. Looking forward, Microsoft is investing in Xbox hardware and software, and the Surface Go is expected to deliver a boost in the coming quarter/year. But that is only scratching the surface! MS needs to get more exclusives on their xbox platform. If they get some great exclusive game titles, the xbox platform can seriously grow, they are missing out on potential revenue while they are sitting on the most powerful gaming console of this generation. They are selling a LOT of these things, it's silly to pretend otherwise. The question is, can they keep the quality up, anecdotally speaking I've had 2 out of box failed units on 10 ordered. Hardly the best impression. However, I've also had nothing that's failed after a month yet. Everything is still going strong, the oldest being 4 years old. So a bad mix of DoA but other than that OK quality control. It's really something they need to improve on.